The story of Billy Morren is one of the most exciting but saddest in Bronaugh's history. William Morren was born in 1855 in Louisiana. About 1882, he married Miss Mary J. Angel who was a young school teacher and daughter of Lawrence and Anna Angel of Moundville. Mary J. was nearly always called Molly instead of Mary. Before long they had a daughter, Nora. At some point, Billy and Molly were the managers of the Bronaugh Hotel on Main Street. About 1897, their son Boyd Morren was born. 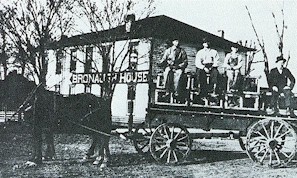 The family continued to manage the hotel, but Billy became the town marshal for Bronaugh. 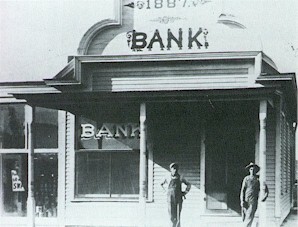 In 1900, a band of robbers rode into town to rob the bank in the middle of the night. Marshal Morren and his wife lived in the Bronaugh Hotel that was across the street (now Highway 43) east of the bank. Marshall Morren opened the door of the hotel to try to do something about the robbery that was in progress but he was shot and killed right there on the front porch. This scan of Billy Morren was shared by the late Deloris Sheridan Heitz. We are looking for the original of this scan. His grave marker in Worsley Cemetery was donated by Bronaugh citizens after the shooting. Miss Nora Morren attended the Warrensburg State Normal School. In 1904, Nora had been offered and had accepted the teaching position at Bethel School near Bronaugh. It was noted that Nora's mother, Mrs. Mollie Morren had taught at Bethel 24 years before. The directors then had been Mr. Brazier and Mr. Woods. Coincidentally, when Miss Nora was hired to teach in 1904, the directors were Mr. Brazier and Mr. Caton, who had been a pupil of her mother's. Several years after the death of Deputy Morren, his widow, Molly re-married. She married Charles Collins in about 1914 (based on information in the 1930 census). Molly was obviously a strong willed lady because the 1920 census lists her as the head of household, age 59 and still working at the hotel in Bronaugh. 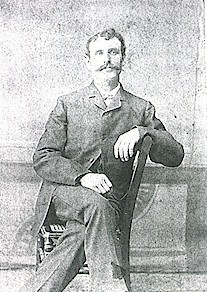 Charles Collins, age 61, was listed as her husband, born in Tennessee and a farmer. School teacher, Laura Mitchell, was listed as a boarder. By 1930, Charles and Molly had left Bronaugh and were living in the Park Addition, Washington Township near Nevada. Charles was listed as age 71 and Molly as age 70. Molly Angel Morren Collins died on April 16, 1942 in rural Washington Township, near Nevada. She fell in her yard and suffered a fractured hip in March. Her death certificate confirms that she was buried in Worsley Cemetery and that her birth date was April 9, 1859. At the time of his wife's death, Charles Collins was already 82 years old. He lived several years more but was eventually placed in State Hospital Number 3 where he died. There is little useful information on his death certificate because the state hospital had minimal information about him. He died February 16, 1948 at the age of 90. The obituary to the right is from the February 18, 1948 Bronaugh Journal. Charles and Molly are buried beside Billy Morren in Worsley Cemetery. For those who use GPS, the coordinates for the Morren grave are N 37° 40.815 W 094° 29.553. Note: Be aware that it is not unusual to see his last name spelled Moran or Moren or Morran but his grave marker says Morren, so I have chosen to go with that spelling. If you have information to share or questions please email Lyndon Irwin.